Threaded inserts for molding in plastics, rubber & ceramics. Patented design. Prototype to production. FREE samples, 2% discount online! TYPE A Molded-In Inserts feature patented designs for molded-in use. Close tolerance of minor thread diameter and careful burnishing of inner thread crests assure snug fit on pins. Extremely flat ends on inserts (with no burrs, ridges or other defects) mean no leakage of material on the face of the mold. TYPE B Molded-In Inserts feature patented designs for molded-in use. 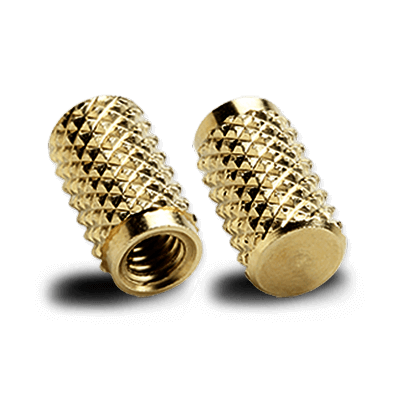 Close tolerance of minor thread diameter and careful burnishing of inner thread crests assure snug fit on pins. Extremely flat ends on inserts (with no burrs, ridges or other defects) mean no leakage of material on the face of the mold. TYPE C Molded-In Inserts feature patented designs for molded-in use. Close tolerance of minor thread diameter and careful burnishing of inner thread crests assure snug fit on pins. Extremely flat ends on inserts (with no burrs, ridges or other defects) mean no leakage of material on the face of the mold. TYPE BB Molded-In Inserts feature a new design for molded-in use. Close tolerance of minor thread diameter and careful burnishing of inner thread crests assure snug fit on locating pins. Both ends of insert are chamfered to eliminate knurl teeth showing on surface of molded part.